Introduction: In the United States, a person dies of coronary heart disease every 39 seconds. 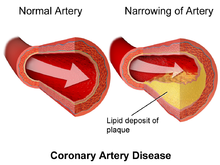 Coronary heart disease is a manifestation of atherosclerotic disease and has many modifiable risk factors. Patients with and without coronary heart disease should be advised to stop smoking, maintain normal blood pressure and cholesterol levels, exercise, achieve or maintain a normal weight, and control diabetes mellitus if present. Pathophysiology: Coronary Heart Disease (CHD) is one of several manifestations of atherosclerotic disease, which begins with endothelium dysfunction. • Endothelium, when normal, balances vasoconstrictors and vasodilators, impedes platelet aggregation, and controls fibrin production. • Dysfunctional endothelium encourages macrophage adhesion, plaque growth, and vasoconstriction by recruiting inflammatory cells into the vessel walls, the initiating step of atherosclerosis. • The vessel wall lesions develop a cap of smooth muscle cells and collagen to become fibroadenomas. • The vessels with these lesions undergo enlargement, allowing progression of the plaque without compromising the lumen. • Plaque disruption and thrombus formation, instead of progressive narrowing of the coronary artery lumen, is responsible for twothirds of acute coronary events. • Plaques most likely to rupture (high-risk plaques) have a large core of lipids, many macrophages, decreased vascular smooth muscle cells, and a thin fibrous cap. • After plaque rupture, the exposed lipid core triggers a superimposed thrombus that occludes the vessel. • Increased thrombosis is triggered by known cardiac risk factors including elevated low-density lipoprotein (LDL) cholesterol, cigarette smoking, and hyperglycemia. • The other one-third of acute coronary events occurs at the site of very stenotic lesions. • Tobacco use and second hand smoke exposure increase the risk of CHD and smoking cessation reduces risk. • High total cholesterol, high LDL, and/or low high-density lipoprotein (HDL) are independent risk factors.